Who can say my wife (girlfriend) or my husband (boyfriend) is my best friend is very rich and blessed in life. A French Toi & Moi ring represents this idea: 2 stones or 2 pearls representing 2 souls intertwined until death do us part. Although these types of rings were already made in the beginning of the 18th century (see also Le bijou de sentiment, an exhibition organised by Chaumet in 2008), I believe it was Napoleon who made this type of ring popular. The to be French emperor offered his future empress Josephine a toi et moi engagement ring in 1795. The ring was made of a diamond and sapphire pear and was sold in 2013 at auction for a million euros. 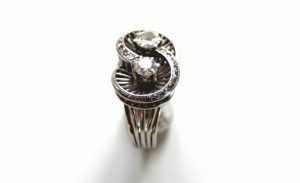 Although not worn by an empress I offer a beautiful and moderate priced toi & moi ring from the 1950s. The 2 diamonds are set in a platinum eternity sign. This ring might just be the perfect gift for your Valentine. 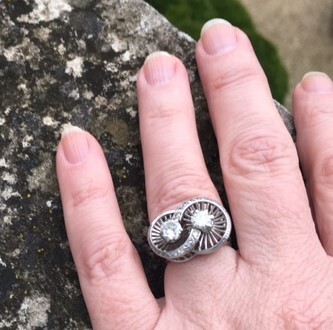 This entry was posted in What's new & Jewelry storytelling and tagged Toi & Moi ring, Vintage jewelry, retro jewelry, french jewelry on 9 February 2017 by Lara. I found a photo of Nicole Kidman attending the Critic's Choice Awards in Santa Monica last year. Do you see where she is wearing her vintage brooch? Pretty fancy place! The geometric pattern of the brooch compliments the triangle forms of her dress. 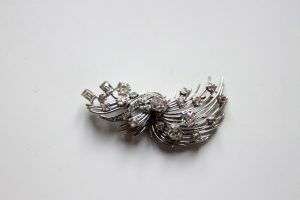 I have in my shop a Mauboussin diamond spray clip from the 1950s. I'm looking for the dress that goes well with this form. Maybe an asymmetric dress from the retro period. Anyone? This entry was posted in What's new & Jewelry storytelling, Other and tagged 1950s, diamond spray clip, Mauboussin jewelry, Vintage jewelry, retro jewelry, french jewelry on 24 January 2017 by Lara.